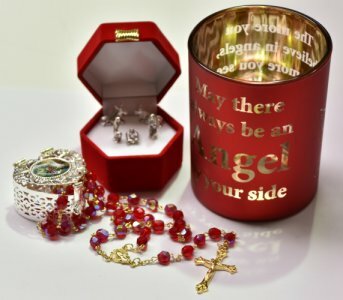 CATHOLIC GIFT SHOP LTD - Christmas Candle Gift Set. > May there always be an Angel glass candle holder. > Silver heart rosary box depicting the apparitions. Dimensions: height 2.5 cm, width 4 cm. > Gold Virgin Mary crystal rosary beads boxed in a rosary box. Rosary measures 18 inches approx..